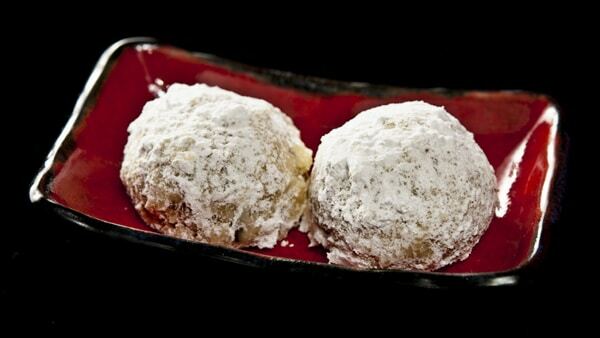 I am not normally a cookie eater, but around Christmastime I make an exception, especially for snowballs. Mexican wedding cakes, Russian teacakes, whatever you call them, these were my favorite Christmas cookie when I was growing up. Mum’s original recipe had regular walnuts and vanilla extract. This recipe is my adult, “I’m a forager” version that uses wild black walnuts, orange flower water and a little Grand Marnier. Orange and walnut work well together, and the combination with the black walnuts — a diamond of a nut that makes regular walnuts feel like rhinestones — and the orange flower water, plus the softness of the powdered sugar all make for a luxurious bite. They actually feel cooling in your mouth. I defy you to eat just one. Make them in one-bite balls, as these cookies are crumbly. Oh, and while this is a small recipe, fit for two people, this scales up perfectly to at least four times, so you can make enough to give as gifts. You can buy black walnuts in many supermarkets. Or you can use regular walnuts, but they are not as good as the wild ones for this kind of recipe. Using cake flour improves the texture of these cookies, but you can certainly use all-purpose; my mum does. And please do try to get a hold of the orange flower water and Grand Marnier: While not strictly necessary, they do add a lot to the flavor. Preheat the oven to 300°F. Mix all the ingredients except the powdered sugar in a large bowl. Mix with your clean hands, mashing the dry ingredients with the butter until you get a mixture that looks like lumpy meal. Form the dough into little balls the size of a walnut and place on an ungreased sheet pan. Bake for 35 minutes. Take the cookies out and let them cool for 5 minutes or so. 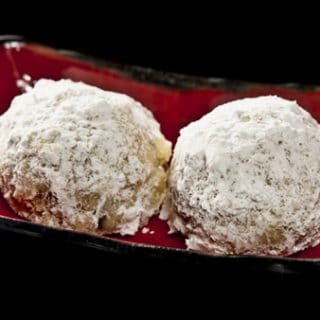 After they are cool enough to handle but still warm, roll them in the powdered sugar and set aside on a rack to cool. 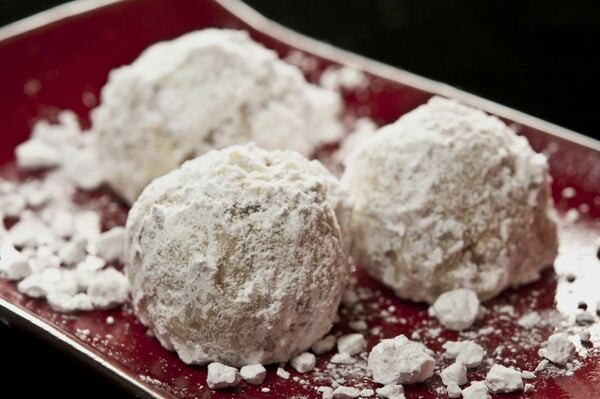 Then, when they are totally cool, roll them in powdered sugar one more time. This looks amazing, I can’t wait to try these. I hate the shop bought walnuts were I live, the fat in them is rancid because it takes them a few years to get from harvest to eating. I tried black walnuts once and they have a wonderful strong flavour and are ideal for cooking however for simple eating out of hand I often prefer to eat the creamy fresh local ones – This is because I always feel guilty eating black walnuts as I eat handfuls of them in a single sitting and I run out. I just started harvesting black walnuts a couple years ago. I run them thru an old hand crank corn shelled that is well over 100 years old. I usually do about 400 in a batch. When they come out of the sheller they fall into a metal bushel basket that has a water hose running full blast into it. Some of the hulls float out and the nuts with no meat in them also float while the nuts that are full of meats sink. I continue running water in the basket until it runs clear. I then put the nuts on a screen for a couple days. When they feel dry to the touch I bag them in small onion sacks and hang them in my shed to dry for a couple weeks before I start to shell them. We harvested about 10,000 nuts this year. My wife bought me a very good nut cracker from photo magnets.com. It is called”Hard Nuts To Crack Nutcracker”. It cost $87.95. Works great. I like to crack twelve nuts and put them in little storage bags “about 1/4 cup of meats”. That has about 140 calories. I store them in the freezer. Makes a nice picker upper snack. Do you need to slow roast them? My husband loves them, but he says they upset his stomach. We are in the Midwest, so we are eating that kind of black walnut. there is a black walnut cracker on e bay and with it and a leather glove you can go a lot faster and I have used an antigue one hole corn sheller to hull walnuts I came here to see if had any better ideas . I too enjoy these special treats and I will be trying your snowball cookies thanks. I recently purchased a black walnut cracker made by a man in NC named Harry Hart. He uses the flywheel gear from an old automobile to make them. The nice thing is that the mating gear decouples and slides along the length of the flywheel gear until the nutcracker is adjusted to the length of the nut being cracked. Then you engage and easily crack the toughest nuts with the leverage. It’s a clever design. He sells them for $60.00 plus shipping, and can be reached at 704-538-8569. Another trick for black walnuts: at least in the East, the easiest thing to do is to wait until the hull is mostly black. Squish it off the nut with your shoe on a concrete surface (this is a good time to test the nut buy gently putting your full weight on it; if it’s not rotten inside, it will support you unless you weigh 500lbs. ), and gather the slimy black nuts in a 5 gallon bucket. Add water to cover, and agitate with a paint stirrer on an electric drill. I repeat this agitate-and-rinse process about 3 times, straining the nuts out of the slop and using fresh water each time. Then I hang the nuts to dry in a mesh bag for at least a couple months, or long enough to forget how much work has already gone into them before I crack them.